"We couldn't be prouder of the effort and dedication our team has put in over the past four months," said Michelle Morin, student co-captain of Laurier’s JDC Central team. "To see it pay off with our sixth win is indescribable." A total of 700 undergraduate business students from 14 universities competed in JDC Central this year in sports activities, parliamentary-style debate, social activities, academic cases in 8 subject areas, and charity. Laurier’s 43-member student team was led by co-captains Morin and Nick Barbour, both fourth-year BBA students. Associate Professor Sofy Carayannopoulos served as faculty advisor. A group of about 20 alumni coaches, along with Carayannopoulos and assistant professors Karin Schnarr and Hae Joo Kim helped to prepare the students. Last year’s captain David Iudiciani and alumnus Srinidhi Srinharan returned to help coach the team as well. School of the Year (sixth year in a row). Academic Cup (fourth year in a row). Second place in Business Strategy. Second place in Management Information Systems. In the 6 years since JDC Central began, Laurier has remained undefeated. 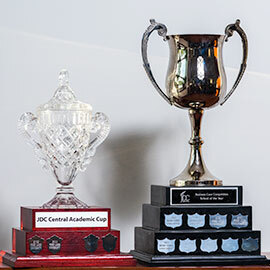 Four years ago, the Academic Cup was introduced and Laurier has dominated that championship as well. The JDC Central competition was held from Jan. 30 to Feb. 1, 2015 in Toronto, and was hosted by the Canadian Association of Business Students. Read the article in The Globe and Mail.